Somewhere in my parents’ home, there’s a book with both its front and back covers missing. When it first fell into my hands, it was brand new, and I would have been about eight years old, which I remember because I can still see exactly where it stood on the bookcase in our old house. The strange thing is that it wasn’t on a shelf I could reach: either someone took it down for me or I made a point of retrieving it myself, and it’s been so long that I’m not sure which was the case. 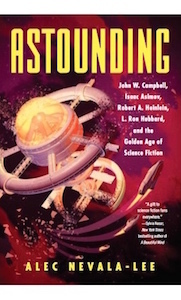 All I know is that for the next ten years, it was rarely out of my sight, and throughout the most formative decade of my life, it was probably the book I read the most. Even now, I know much of it by heart, and I’ll occasionally find its phrases and rhythms appearing in my work, like fragments of my own memories. It was Roger Ebert’s Movie Home Companion, and when I look back now, I realize that it wasn’t just the book that first introduced me to the movies—which would be legacy enough—but one that made me think for the first time about journalism, criticism, and countless other aspects of the world and culture around me. Cinema is a river with many tributaries, and I’m sure I’m not alone among movie-crazy teenagers in the ‘80s in using Roger Ebert’s Movie Home Companion as the boat downstream. You go through all the four-star reviews. You see Taxi Driver, and then of course you have to see Raging Bull, and then every other Martin Scorsese picture that sits on the video shelf. (And then you get into the movies that influenced Scorsese, which is a lifetime in itself.) You argue with him, you glean insights in the things you watch, you learn an entire new way of thinking, talking, and writing about the movies. And you never stop watching. You never stop debating. You have a companion for life, even now that his is over. “The old man was around for a long time,” Ebert says of John Wayne in The Shootist, and although Ebert was only in his thirties when he wrote those words, the same could be said about his own career. 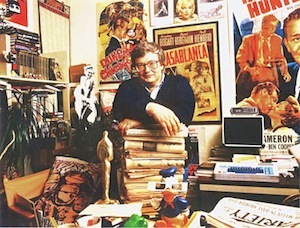 Ebert was the one who first taught me that, at his best, a critic is sort of an island of stability, staying at the same desk for forty years to regard a changing world through a very particular lens, until his body of work says as much about the decades through which he lived as about the movies themselves. Ebert once seemed more stable—and certainly more substantial—than most, and at his prime, it was hard to believe that he would ever be gone. Toward the end, of course, this changed. Yet it’s in the last act of his life that his influence will be the most profound: he proved that criticism, a trade that has often been denigrated and dismissed, can give us the tools to face the fact of our own mortality with honor. 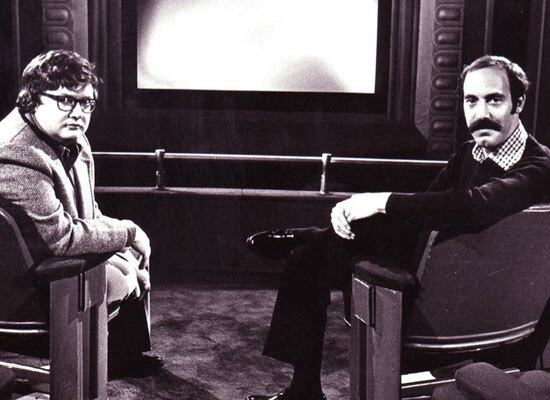 At the end of his life, Ebert seemed reduced to little more than his words and, remarkably, his thumb, as if his most famous trademark had really been a mysterious preparation for a time when it would be all that remained. And in the end, his words were enough.